Are your Group Policy Preferences not applying? Most of the time, these issues will come down to a handful of items and misconfigurations. As awesome as they may be, Group Policy Preferences (GPPs) gave us a whole new set of challenges and a few new ways to troubleshoot. Let's go through the top ways to troubleshoot preferences (and learn a few performance tricks on the way)! A common mistake in Group Policy is applying computer node settings to users and user node settings to computers (without loopback). Preferences are a bit more flexible on this as everything in the computer node (but Shares and Services) exist on the user node . Just keep in mind that if you are going to configure Internet Options, set a default Printer, or edit the Start Menu, the GPO will need to be linked to a user OU or a computer OU with Loopback enabled. In our example above, we are using OUs in our ILTs instead of Security Groups. Filtering by OU is a heck of a lot faster than filtering by groups. OUs have one downside though - if you change the OU name or move the OU, the ILT breaks. It will not automatically update itself with the new name/location. As a note, you can rename Groups without breaking an ILT as they are linked by unique SIDs. Choosing the right method (Create/Replace/Update/Delete) will ensure your preference applies and carries your configuration. Let's say you are currently deploying network printers with Preferences. Because you love efficiency, your printers are set to Create. You get a request to enable Duplexing on a Printer. You do so but the duplex setting is never copied to the clients. For your clients to reapply the setting, you will need to change your setting from Create to Update or Replace. This same problem applies to other Preference extensions, most notably: Power Options and Scheduled Tasks. 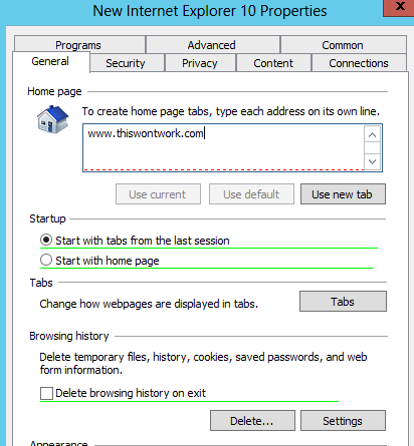 Certain Preferences, like the Start Menu or Internet Explorer Settings, mimic the GUI menus from the actual OS. While it makes configuring the preference easier, it does add one potential problem. Not every item in the preference is enabled by default. In the picture above, notice how certain settings within the Internet Explorer preference have red or green lines under them. Any preference with a red line will be disabled within the preference. Preferences with a green line are enabled. If I wanted to enable the HomePage setting, I could enable it by pressing F5. This would enable every setting on this tab. If I selected the HomePage setting first, I could solely enable it by pressing F6. Those are the top problems that I've faced with Preferences! What issue have you seen? Let me know and I will expand this list!